Do we want MORE marijuana use? Or do we want LESS marijuana use? The motivation of marijuana profiteers is MORE marijuana use. The Controlled Substances Act had brought use and exposure rates to this drug to its lowest levels in 1992. If that is called “prohibition”, that actually works. Responsible drug policy brings down rates of demand and harm from the drug. That is protective of the broader public health. That’s why Dan Riffle left the Marijuana Policy Project (MPP). Because it became all about marijuana profits. NOT harm reduction. The smartest guy on their team in DC left. A conscientious objector to the takeover by the marijuana moguls “addiction for profit” business model. Since commercialization’s political forces have gone to work in the 1990’s, use rates have risen. And now the industrialists and their attorneys are seeking to amplify the trend. There have been increases in the population percentage rates of use of the drug since legalization — with Colorado now topping use rates in all categories — double the national average for adults. Can you imagine if tobacco smoking rates were rising at that level? What would be the appropriate response? Tobacco is a much better cautionary case study. It’s taken 50 years, and billions of dollars, to bring down tobacco use rates from well over 50% to the still-too-high 20ish%. That’s because of Big Tobacco’s political/rule making, financial and marketing might — industrial influence which is pre-designed into pending marijuana ballot questions. Tobacco still causes 450,000 cases of disease and premature deaths each year. You don’t die young of tobacco use. The consequences come later. Big Marijuana is using these political campaigns to kick open the doors on the market to push more of their drug in Massachusetts and other states. Out-of-state, large pot investors are Directors of the MPP and the drivers and funders these political efforts. For personal profit. Big Marijuana wants MORE drug use. Their bottom lines will depend on it. 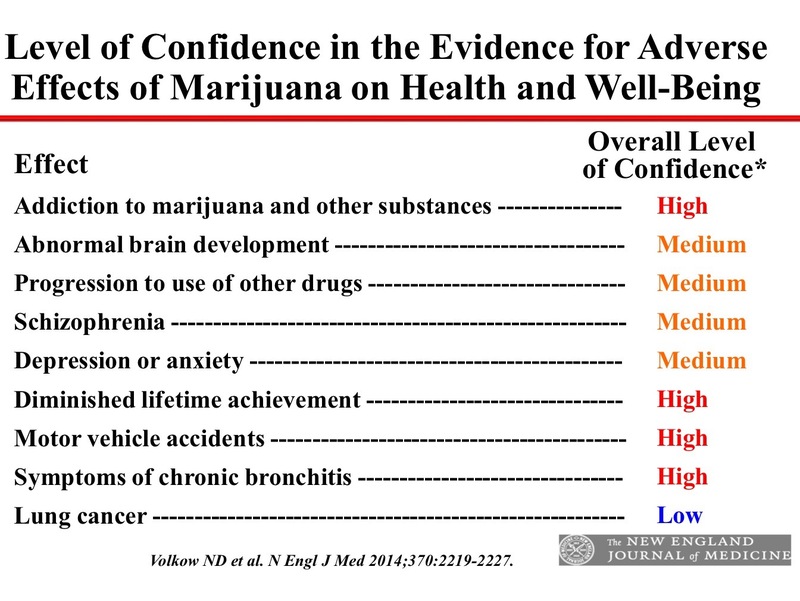 The negative health impacts of marijuana use are clear: NEJM June 2014. And the evidence is becoming clearer.